I have heard tales in the corridors here of total madness/spectacle about to unfold on the Wattis stage. Tonight at 6:30 THIRTY-THREE CONTESTANTS chosen from last week’s solo auditions for Tony Labat’s I WANT YOU project will perform for your vote. The performances are set to be staged in three rounds, hosted by poet/activist emcee Jason Mateo, and with inter-act entertainments by local chanteuse Veronica Klaus. The audience will choose five winners via old-fashioned school-style scantron ballots that will be tallied up live onstage at the close of the eve; as each winner is announced, he or she will be whisked away to be immediately photographed for their poster+slogan, with the audience watching the backstage proceedings over closed-circuit live feed. 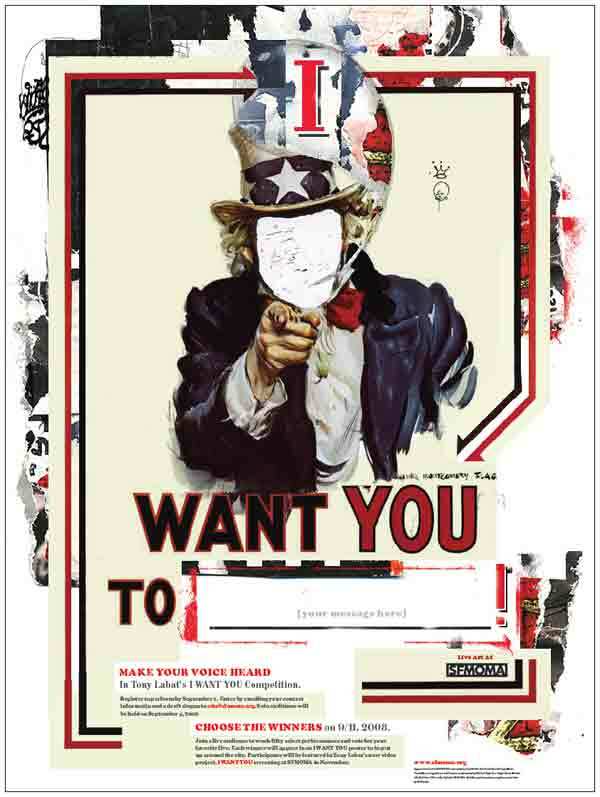 I WANT YOU: TO SHOW UP AND VOTE!